The official June 16 statement was barely uttered when the majority nationwide opposition to the Trump Cuba policy was once again reignited. Indeed, it was already extremely active and vocal before the Little Havana, Miami venue and date were announced on June 9. By stage-managing the event in Little Havana, Trump was preaching to the choir, one that does not even include the rest of Florida, where the majority of Cuban-Americans oppose the blockade, or at least support the Obama policy of making the blockade somewhat more flexible. Trump’s trademark manner of hand-picking events to spread the word across the country will not work. His Cold War rhetoric will not detract the forces that want to increase trade and travel to Cuba. Thus, it was only last month, on May 3 (six months into his mandate), that he convened a special meeting on Cuba at the White House, including his top officials and Republican Florida Senator Marco Rubio and Representative Mario Diaz-Balart whom initially favoured breaking diplomatic relations with Cuba and shutting down the U.S. Embassy in Havana. In this meeting, it was clear that the upper-level civil servants at Homeland Security and the State Department wanted to continue the Obama policy. In fact, State Department Secretary Rex Tillerson, during his January 2017 Congressional confirmation hearing, was quite ambiguous with regard to any major change to the Obama policy. In another hearing before the Senate Foreign Relations Committee, just last June 13, Tillerson was likewise obscure regarding a major rollback in Cuba policy. According to some American press sources, Tillerson has privately expressed support for the Obama policy. National Security Advisor H.R. McMaster and the White House Chief of Staff Reince Priebus agreed with the Trump/Rubio “from the top-down approach” to by-pass opposition. Thus, Trump handed over the task of drafting the policy to the White House staff and National Security Council whose advisor H.R. McMaster also agreed with the Trump/Rubio orientation (instead of entrusting Homeland Security Secretary John Kelley and Tillerson’s State Department), with Marco Rubio and Diaz-Balart as the main advisors. 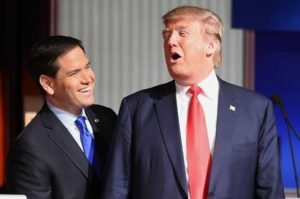 Now, how did Marco Rubio go from “Little Marco,” as Trump ridiculed him during the primaries, to Big Marco the Playmaker on Cuba policy? The Senator sits on the Congressional Intelligence Committee and was one of the few who exonerated Trump during the Comey hearings earlier this month. Is this one of the reasons that Rubio was provided this privileged position? How indispensable will Rubio be in the next few months? Likewise, what would the U.S. Treasury Department do if American visitors were to enjoy a snack or a drink at the iconic Sloppy Joe’s Bar or the equally emblematic Floridita in Old Havana, unaware that they are both run by the Army enterprise group? If Treasury foolishly goes through with Trump’s June 16 directive, the U.S. will be depriving American visitors from access to these landmark restaurant/bar reminders of U.S. presence in Havana before the Revolution. On June 16, Trump made a point to single out Venezuela as well. 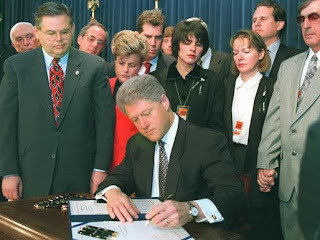 It was another instance of gross interference in the internal affairs of a Latin American country, as he did with Cuba. The Organization of American States (encompassing all 35 countries in the hemisphere except Cuba) is meeting June 19–21 in Cancun, Mexico. It is a regular session of all foreign ministers, thus the U.S. is being represented by Secretary of State Tillerson. What will the reaction of the member states be? Will Trump’s arrogant outpouring on June 16 push more and more countries against U.S. interference in the region and thus have a boomerang effect on Trump’s announcement? On June 18 it was announced on that Tillerson himself is not attending the OAS Summit in Cancun. He is being replaced by Kevin Sullivan, U.S. Interim Representative to the Organization of American States and Michael J. Fitzpatrick, Deputy Assistant Secretary for Andean, Brazilian, and Southern Cone Affairs. On June 19, at a special Press Conference from Vienna where he was visiting, Cuban Foreign Minister Bruno Rodríguez passionately detailed the real terrorist nature of those Cuban Americans from Miami lauded by Trump. He stated that the Trump policy “will reinforce our patriotism, dignity and determination to defend national independence in the spirit of José Martí, Antonio Maceo and Fidel Castro.” However, he reiterated that Cuba will continue to deal with the U.S only on the basis of mutual respect. Arnold August is a Canadian journalist and author of three books on Cuba, the most recent being Cuba–U.S. Relations: Obama and Beyond, which includes an analysis of the unfolding Trump Cuba policy. 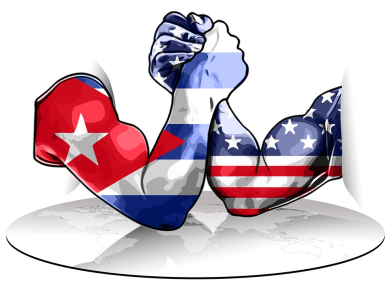 www.CubaUSRelations.com.